St Eusebius was born in Sardinia. He was a Church Reader and in recognition of his piety and devotion, he was appointed Bishop of Vercelli in preference to other esteemed candidates. As Bishop, he led his clergy to establish and embrace, a monastic lifestyle. 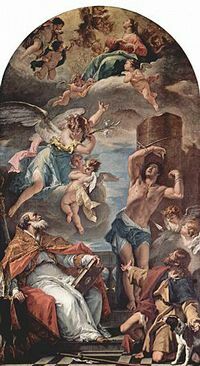 St Eusebius was exiled, firstly to Syria and later Egypt, and tortured for refusing to condemn Athanasius, Bishop of Alexandria, on matters of Arianism. In 362, along with other exiled Bishops, he was allowed to return to his Pastoral See. On his return journey to Vercelli, he attended the Athanasius synod of 362 and attempted to reconcile various church divisions in Antioch and reinforce church teachings elsewhere. In 363 and back in Vercelli, St Eusebius with Hilary of Poitiers defeated Arianism in the Western Church. Only a few of St Eusebius’ writings have survived. His Feast Day is the 2nd August. He is the Patron Saint of Vercelli. Pray for us that we will speak the truth and strive to avoid all conflict.